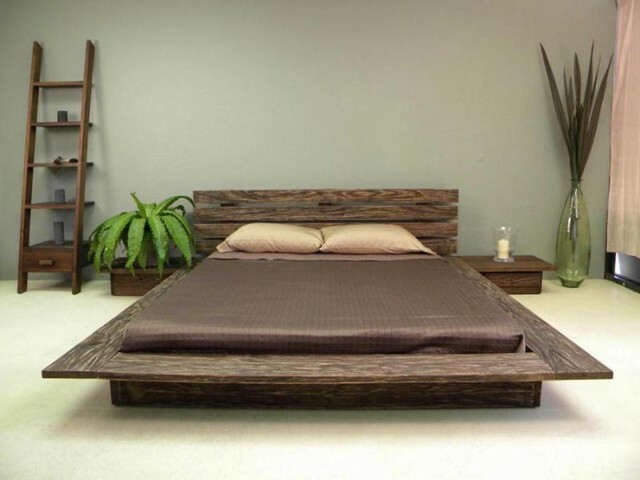 One of the most widespread and functional platform beds with storage will be equipped with drawers. This is a fantastic furnishing solution for a small bedroom, offering you a chance to downsize on a separate chest of drawers. If you are looking for a spectacular decoration solution that will give your bedroom a unique look, go with a round bed. A lifting mattress will offer more than enough storage for a variety of objects. And, of course, the same models can be found in classic, rectangular shapes. Unlike a lifting platform, a sliding one offers greater comfort of usage. It will not take a lot of effort to slide the mattress away, which is also a suitable storage space for items you use often. A solution like that will not be found ready-made, but if you are willing to go bespoke, it will offer a lot of perks — from increased storage capacity to a stylish, eye-catching mini-stairs to accessorise the room. Open platform with mini-cabinets on wheels will give your bedroom a truly unique look with a touch of retro. The major perk of going with a partially open platform is a chance to customise your storage compartments. For example, you can go with sweet rattan baskets instead of built-in factory-made drawers. Another great example of spectacular storage platforms beds that make a beautiful home while giving a huge boost to its storage capacity. Moreover, both drawers and cabinets in the platform account for a more flexible usage. Finally, do not discard the possibility of elevating your bed even higher and equipping the space below with something functional — like a workstation or a study, for example. All in all, any of the above-mentioned platform beds can help you make the most out of your bedroom storage, as a result optimising your bedroom space in the most efficient manner. And, if you would like to take bedroom space optimisation to a totally new level, here are a couple more furnishing ideas for small rooms.